Christmas is just around the corner and as such the colors red and green are everywhere. Yet, instead of Santa’s suit and elves’ uniforms, my thoughts are drawn to the signature dual colors of incredible 3-D comics, and the work of third dimension master Ray Zone! I’ve been looking back upon Zone’s work quite a bit recently in light of viewing the 3-D Thomas Jane and Timothy Bradstreet film Dark Country at the 2010 Long Beach Comic Con. Zone worked as the 3-D consultant on the highly entertaining supernatural noir which had, amongst other innovations, the first handheld 360 degree shot ever filmed in 3-D.
Zone’s amazing work in the comics medium traces back to the early 1980’s with his self-published title The 3-D Zone. For this first of two very special installments of Sequential Sunday, I’d like to present some of the amazing, multi-layered imagery from this title. So, grab your pair of old school red and blue lens 3-D glasses (if you don’t have them, you can find them here) and prepare to zone out while you fall into the third dimension! 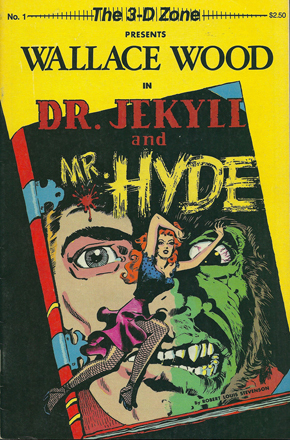 The premiere issue of The 3-D Zone features a reprint (much of the material in The 3-D Zone series are reprints of classic comics) of Wally Wood’s first published horror work, an adaptation of Dr. Jekyll and Mr. Hyde. Wood’s signature, highly detailed art just itches for the 3-D treatment and Zone supplies it in grand fashion. An interesting note is that Wood’s art assistant for Jekyll was Harry Harrison, who would go on to be an important name in science fiction literature. Amongst Harrison’s many books is the essential Make Room! Make Room! which would go on to be adapted into the classic sci-fi film Soylent Green. Issue 2 presents the incredibly bizarre art and stories of the great Basil Wolverton. Remembered by most for his work during the early years of MAD, it is in his own science fiction tales where his fevered imagination really shines. PERFECT material for the 3-D treatment! The biggest treat in issue 2 is a mind-blowing gallery of Wolverton’s wordless images depicting nuclear war and its hopeless aftermath. The 3rd issue gives the 1954 story/coloring book, Jungle Adventures, a highly effective Zone treatment. L.B. Cole’s full page splash panels are tailor made for the third dimension and this edition also features photos of real animals in it’s final pages. The legendary cartoonist/automobile pin-striper Ed “Big Daddy” Roth is paid tribute in issue six alongside his immortal creation Rat Fink. 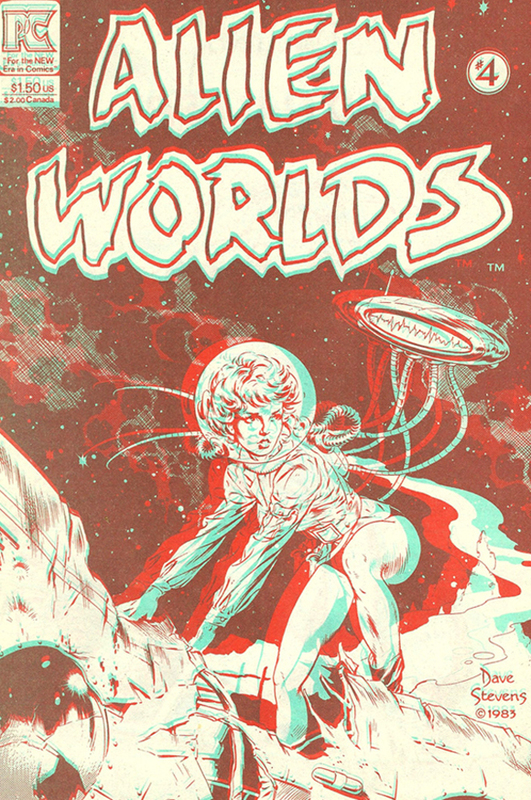 Though the covers of these comics are not in 3-D, the colors used for them are still downright psychedelic with the glasses on. Number 11 is a BIG favorite of mine, because not only does it feature a cover and story by the obscure 1950’s horror artist Matt Fox, but also because the bulk of the issue contains imagery featuring Death as it was represented in art from the Middle Ages on up to the 20th century. Also, about the previously noted effects the covers have, this particular one looks so electric with the glasses on it would probably fry the eyeballs right out of your skull if you look at it too long. #13 reprints a full Flash Gordon tale by the legendary Alex Raymond. The grand, fantastical worlds of this all-time great strip look spectacular with Zone’s masterful multi-layered effects. Dave Stevens’ beautiful sci-fi and pinup art takes center stage in issue 16. The cover image, which would go on to be one of Steven’s most famous, was created specifically for this comic. This issue also contains stellar art and writing from another master of the medium, Bruce Jones. What we’ve seen here is just a sample of the wining combination of comics’ all-time greats and top tier 3-D in Ray Zone’s self-published 80’s comic The 3-D Zone. Still, the run of this series is only a fragment of a highly prolific career that continues to this day. Join me again next week for Part 2 of this look at Ray Zone’s 3-D, including his work on classic, independent, and mainstream titles like The Spirit, Batman, The League of Extraordinary Gentlemen, Final Crisis: Superman, and Clive Barker’s Seduth. And if you don’t have those red & blue glasses, get them. You get more bang for your buck with any of these comics than the last 3-D film you shelled out 20 bucks for. The hell with Avatar! 3-D comics are forever!